With the 80 Day Obsession Timed Nutrition Plan, the first thing you want to do is calculate your calorie target. Then you’ll match that number to the number of these colored containers you’re allowed to eat each day. 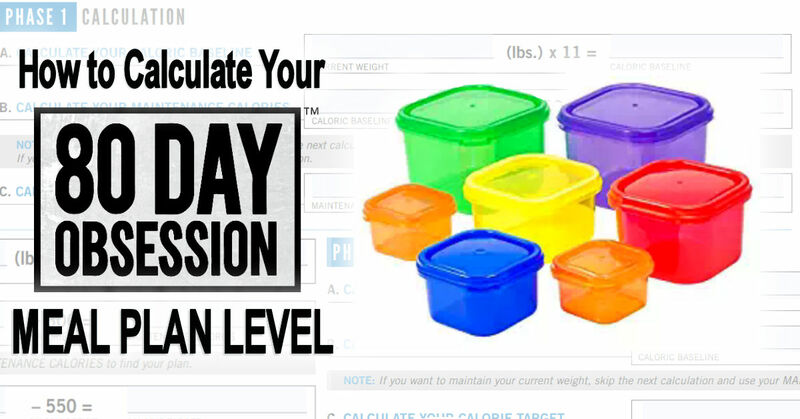 Luckily the formula to determine your meal plan level for the 80 Day Obsession is a simple 3-step mathematical calculation that takes your bodyweight, activity level, and the amount of calories you need to maintain energy levels into account. The 80 Day Obsession workout program is three phases of four weeks. After each phase, you will want to revisit this post and recalculate your 80 Day Obsession calorie level. If you’ve done the 21 Day Fix or any of the latest Beachbody workout programs, you can probably skip this section. For everyone else, there are color-coded containers you can use to measure out your food. Each container represents a different food group. Depending on your calorie needs, which we cover that in this post, you get a specific number of containers to eat each day. The meal plan also contains tips, info, and how to measure odd-shaped foods. Multiply your current bodyweight by 11. 2. Add 600 to you caloric baseline from step 1. 3. Subtract 750 from your maintenance calories. Note: To maintain your bodyweight do not do step 3. 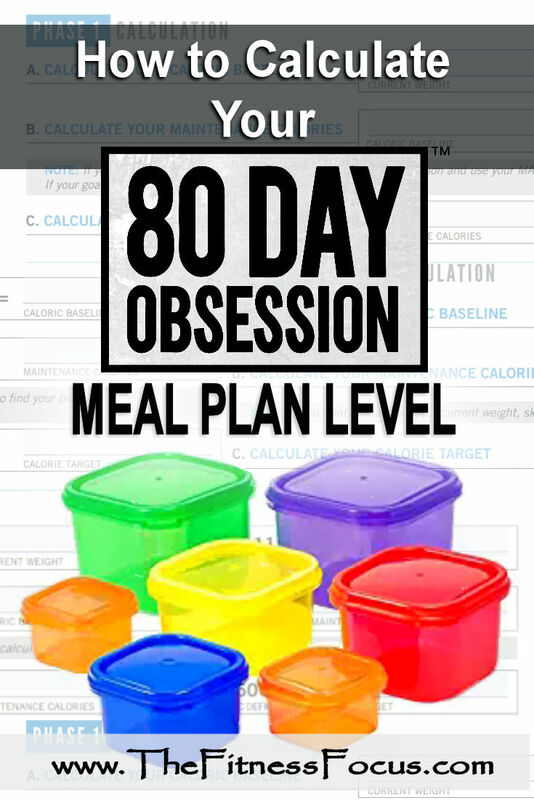 Then you can go to the 80 Day Obsession Meal Plan that your calorie target range matches to get the number of colored containers you should be eating each day. Your guide also goes into detail about how to time your meals and includes sample meal plans. At 135 pounds, I multiplied 135 x 11= 1485 for maintenance calories. Then I add 600 + 1485 = 2085 for maintenance calories. Then I subtract 2085 – 750 = 1335 as my calorie target. I then take 1335 and match it to the 80 Day Obsession Eating Plan A-F as shown below. The only two times you’ll be calculating your calorie level with the 80 Day Obsession is at the end of the first phase and again at the end of the second phase. At first glance you would think it would be as simple as subtracting 200 from your previous Phase 1 calorie target to recalculate, but you’ll need to run the numbers over again if your body weight has changed. 3. Subtract 550 from your maintenance calories. All of the steps to calculate your calories for Phase 2 and 3 of the 80 Day Obsession is exactly the same except you subtract 550 instead of 750 for your maintenance calorie needs. Again, if you want to maintain your body weight and not lose weight, do not calculate step 3. Question: Do I recalculate my meal plan level as I lose weight? Answer: No, you only need to recalculate your meal plan figures at the end of phase 1 and at the end of phase 2. Question: Do I need to adjust my calories if I am pregnant or breastfeeding? Answer: It is not recommended to follow the 80 Day Obsession if you are pregnant. If you’re breastfeeding, be sure to consult with your physician prior to beginning. The guide suggests not subtracting the “calorie deficit” if you are looking to lose weight while breastfeeding. To maintain, do not subtract the “calorie deficit” and go up one calorie level. Question: What is a refeed day? Answer: Starting week 6 of the program, you can increase your carb intake to help replenish your muscle glycogen stores. Glycogen is what your muscles use for energy while during workouts. Question: Do I have to use the supplements? Answer: No, they are optional supplements, it is suggested you take them. But the foods you eat are most important. I always tell people to think when they struggle. Sometimes a pre-workout supplement can help you get ready for your workouts. For me, a post-workout protein shake is always a must and Energize really helped for those nights when my little one was up teething. Question: Do I have to do the refeed days? Answer: Why wouldn’t you? These days are kind of like mini cheat days and are really important. The extra carbs can help restore some of your energy levels by bringing more glucose to your muscles. It’s a win for everyone. Need help determining your meal plan level for the 80 Day Obsession? Please leave a comment below.